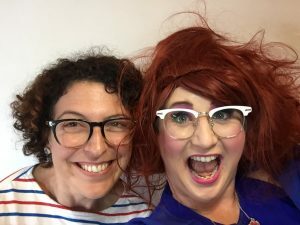 Rumour has it that Famous Sharron is heading off to Hollywood… but before she does she’ll be returning to Perth Comedy Festival and Sydney Comedy Festival with her latest show, Famous Sharron’s Love Match. Nina Levy caught up with the fabulous Shaz ahead of all the excitement. 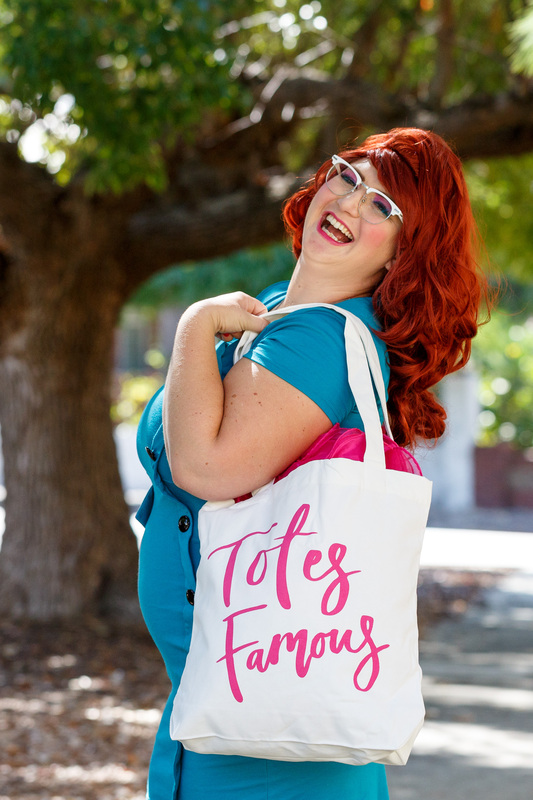 Famous for… nothing: Famous Sharron posing with her own merch, which you can purchase here. If you live in Perth you’ve probably come across Famous Sharron because, well, she’s famous! Plus it’s hard to miss the ebullient Shaz. With her bright pink eye shadow and lippie, out-size retro glasses, fabulous frocks and a generous serve of diamantes, Sharron stands out in a crowd. And everyone who’s anyone has taken a selfie with Famous Sharron. But just in case you’ve somehow missed her, here’s the lowdown. Famous Sharron (AKA comedian and producer Bonnie Davies) is famous for… nothing. Kardashian-style, she has made her name simply by being her outrageous self since her Fringe World debut in 2013, where she won the Spirit of the Fringe award. She’s since scooped two more Fringe World awards, as well as awards at New Zealand Fringe Festival and the Pride Festival Parade. With regular appearances on TV and radio, and in the social pages, there’s no question that Famous Sharron is a Perthonality. Sitting in a Northbridge café, waiting for Famous Sharron’s alter ego, Bonnie Davies, to appear, I suddenly wonder, will I recognise her out of costume? Minutes later, my fears are assuaged, when I look up and see Famous Sharron taking one of those Famous selfies with a very excited fan. Ok – full disclosure. My fears have been allayed but they are replaced with a new set. I mean, Famous Sharron is hilarious… but famous people scare me sometimes, especially when they have a Perthonality the size of Shaz’s. Even though there is no one witnessing our encounter (beyond the café staff), I feel a flicker of the same sort of terror that I might experience if selected for audience participation at a show. But while Famous Sharron may appear to be all about herself, it becomes apparent that one of the reasons she’s so well loved is that she takes good care of her audience… and she’s so easy to talk to. I almost forget that she is a character and not an actual person, so much so that eventually I ‘fess up that the interview questions I’ve prepared are not, in fact, for her, but for Davies. The obligatory selfies: Seesaw ed. Nina Levy and Famous Sharron. Sharron doesn’t flicker. She can answer on behalf of Davies, she assures me. It starts to feel like it’s Bonnie Davies who is the fictional character. I’m interested to know how Davies came to be a producer as well as a comedian – I’m guessing it wasn’t a combination promoted as a career option when she was graduating from Perth Modern School in 2001. And was she? “No one really paid attention to her because she wasn’t that amazing but she got good at being in front of crowds and things,” replies Sharron. “But then she discovered ME and then everyone just wanted ME! So she doesn’t exist anymore… because why would you compete… with this?” Sharron makes a sweeping gesture to indicate her general fabulousness. Quite. So how did Davies discover Sharron? I’m not going to make you do a selfie. If you’re not ready you can start by photobombing behind other people doing photos. It was important to Davies that the character was Australian, continues Sharron. 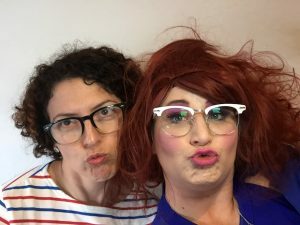 “Bonnie kept seeing people do cabaret shows as American or English and had just seen the Briefs Factory show, and Fez was hosting it, the most glamorous, fabulous, glorious drag queen… with a really Brisbane accent,” she adds with a Queenslander drawl. “And she realised that she’d never seen that before. And that was pretty special. 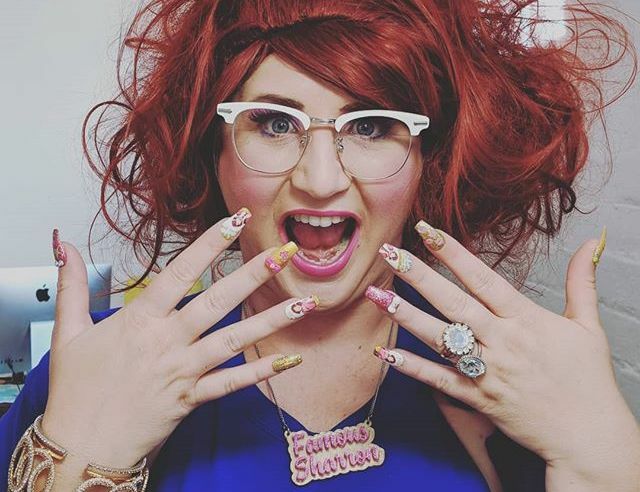 The next big event on Famous Sharron’s calendar is her new show Famous Sharron’s Love Match, which will hit the Perth Comedy Festival April 27-29 ahead of a season at the Sydney Comedy Festival in May. Joined by two surprise celebrity ball handlers each night, Sharron will be finding Perth’s own “Nicole Kidman and Keith Whatshisname”. When I mention the upcoming show, she gives a squeal and claps her hands. “I’m so excited,” she exclaims. “It’s just a joy because it’s all my favourite things. I get to bring up people from the audience – only if they want to be brought up darls – I’m not someone who’s going to badger someone into participating. It’s like if I take photos of people and they’re not ready for a selfie, I’m not going to make you do a selfie. If you’re not ready you can start by photobombing behind other people doing photos. You connect to the show on level you are ready to connect, but there’s always plenty of people who are so excited to be on the stage. Sometimes even I forget to have fun, cause I’ve got a photo shoot in the morning, an interview… it all takes up so much time. I’m so busy, sometimes I have to just remember to enjoy the manicure. It’s clear, though, that while Sharron enjoys the celebrity aspect of her work, it’s the audience that is closest to her heart. We both take a moment to admire her nails which are variously decorated with leopard print, glitter, jewels and, impressively, tiny pictures of Famous Sharron. 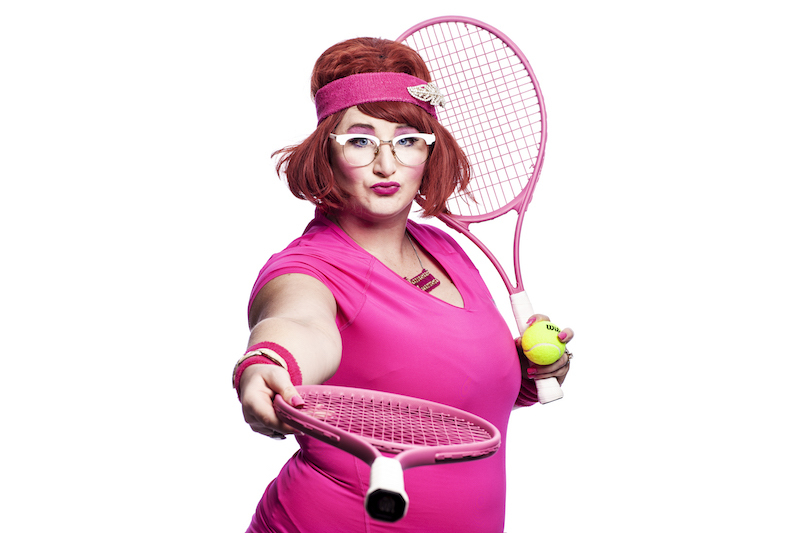 Famous Sharron’s Love Match plays the Perth Comedy Festival April 27-29.